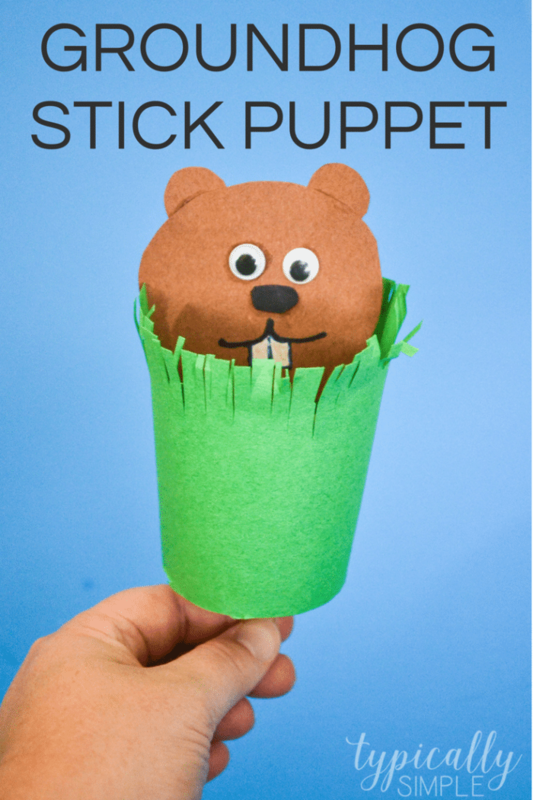 Grab some craft supplies to make this cute groundhog stick puppet for Groundhog Day! The kids will have so much fun popping the groundhog out of his little burrow – will the groundhog see his shadow on February 2nd? I always secretly hope that the groundhog really does predict the next six weeks of our weather when he pops out of his little burrow, especially after a long & cold winter. Although, if he does see his shadow…I’d rather it all be an old wive’s tale because six more weeks of winter does not sound like fun to me! Either way, the groundhog always looks so cute when he pops his head up and looks around, so I thought it would be fun to make a Groundhog Day puppet with some basic supplies we had in our craft room. This is a great way for the kids to recreate if the groundhog sees his shadow or not! Cut a strip of green construction paper that is slightly taller than the cup and also making sure it’s long enough to wrap all the way around the cup. Using scissors, snip fridge on one long edge of the green construction paper to make the grass. Poke a hole in the bottom of the cup using scissors, making sure it’s large enough for the popsicle stick to fit through. Then wrap the green construction paper tightly around the cup, taping the two ends together. 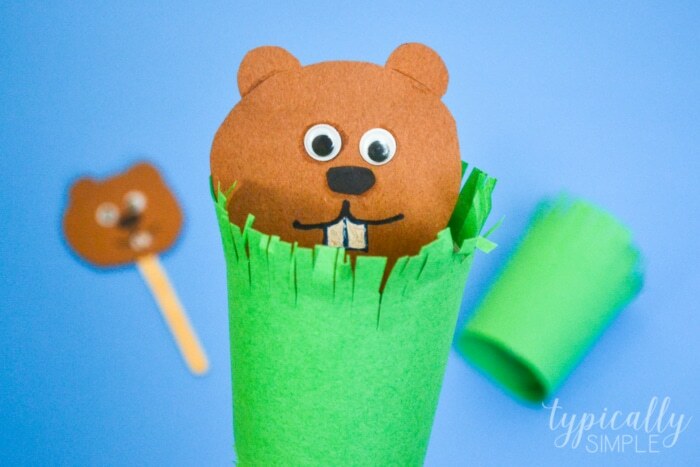 Create the groundhog’s face using the construction paper and googly eyes. Add a mouth and some teeth with markers or crayons. Attach the groundhog’s face to the popsicle stick by taping it to the back. And finally push the popsicle stick through the hole from the top of the cup to finish your groundhog stick puppet! So cute! If you are making the groundhog puppet with the class, do a little prep work ahead of time depending on the age of the kids by cutting paper strips, poking the holes in the cups, etc. Tape definitely works best for this project, but hot glue will also work. The tape works well for making it more of a kid-independent craft! Paper cups are much easier to poke a hole into than the plastic cups. Have fun making your puppets and be sure to share on Instagram using #kidspiration! I’d love to see all of your groundhogs! Looking for more fun kids’ crafts? Be sure to check these out!